Place: Mt. Olympus 2 day hike. We will climb to the home of the ancient Greek gods and stay at the Olympus' mountain huts! About the place: A unique hike at Mt. Olympus and its highest peak Mytikas. Mount Olympus is a world-wide known for being home to the gods of the Ancient Greek Mythology and undoubtedly one of the most spectacular mountains to climb, due to the nature of its landscapes, the rich flora and its endless views to the Aegean sea and the sandy coastlines as far as the eye can see. It was the first official National Park of Greece since 1938 and a World's Biosphere Reserve. Its paths are tied to myths and legends and hiking it will be a magical experience. This hiking vacation package is addressed to the real mountain lovers who will enjoy a daily 7-9 hours trekking on the pathways of the mountain and will be accommodated in the mountain refuges. How to reach Olympus: Litochoro village will be the starting point of our hiking tour to Olympus. Easy to reach from Thessaloniki or Athens by train or bus. Level Requirements: We will hike Mt. Olympus for 7-9 hours per day and will follow good forest paths mostly; above the tree – line, the terrain varies from grassy uplands to rocky ridges, with some scrambling required for the peak ascents. A good level of fitness and experience is required to climb the peak. Please keep in mind that our guide reserves the right to make the final decision if the group will climb to the final peak. How to reach Litochoro: being at the entrance of Mount Olympus, Litochoro is surrounded by places of astounding natural beauty but also by historical monuments like Dion, an archeological park with theaters and temples dedicated to Zeus, or the castle of Platamonas. Located at only 5 km from the seaside, it is an ideal place to enjoy both mountain and sea vacations. Agios Panteleimonas village on the mountains and Leptokaryes village by the sea, are two other picturesque villages of the area that worth a visit. After your arrival you will meet your guide and the rest of the group in Litochoro. We will then get transferred to Prionia, where our hiking will begin, at an altitude of 1.100 metres. The route from Prionia to Spilios Agapitos Refuge is the most frequented hiking path on Mount Olympus and is a part of the E4 trail. Prionia is the highest point which can be reached by car. Most of the hike is through a thick forest of pine, beech and fir trees, and the path is in good condition. We make our way up to 2.100 m alt. and reach the refuge. From the refuge, we follow a short zig-zag path that will lead us just under the mountain's main summits. Soon after we will see an alpine plato at an altitude of 2700 m where a small but friendly refuge will accommodate us (5-6 hrs of walking ). We will relax and eat our lunch and then we can climb a small peak, named Profitis Ilias, just above our refuge, to admire the superb views of Mt Olympus summits. We will wake up early in the morning. We will have two alternative options, according to the group's fitness and the weather conditions: We will either climb first Skala at 2.882 meters and then crossing a narrow ridge will climb to the summit of Skolio at 2.911meters. Or if the weather permits it and there is no snow, we will ascent to the main summit - Mytikas - at 2.917 meters, Greece’s highest peak, following a narrow gorge which will require about 150 m of scrambling, 4-5 hrs of walking on narrow paths and our altitude gain will be 800 m.
After reaching the summit, we will descent by using the same way to the main path and will cross the spectacular precipice under the summit of Stefani - the throne of Zeus- and then we will emerge to the plato of the Mouses. After about 2 hours we will spot a new refuge, the refuge of Hellenic Rescue Team (Petrostrougka refuge at 1.940 m) where we can eat our lunch and rest. From there the end of our tour is close, aand fter a small break we will continue until we reach our destination, Gkortsia, which is the last point of our tour (2 – 3 hrs walking). • As Mt. 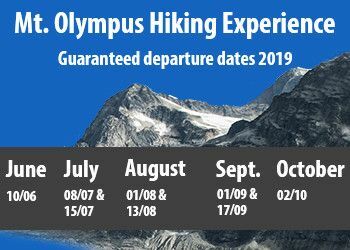 Olympus is a challenging walk and the safety of our clients always comes first, our guides retain the decision if clients are to actually climb the peak of Mytikas. This will depend on both the clients’ abilities and weather conditions. In the case of snow, the ascent to Mytikas is not possible. • The trip starts and ends in Litochoro. For travel arrangements to/from Litochoro or accommodation in Litochoro please contact us.